Kristīna Namavīre carries a Little Prince Notebook with her everywhere she goes. Much like the Little Prince, she is a dreamer as well. She dreams of a world where people become aware of their actions and accept the realness of the world. We produce posts to different social media channels every day but is the content suitable for everyone or should it be seen by people who really want to see what we are up to? 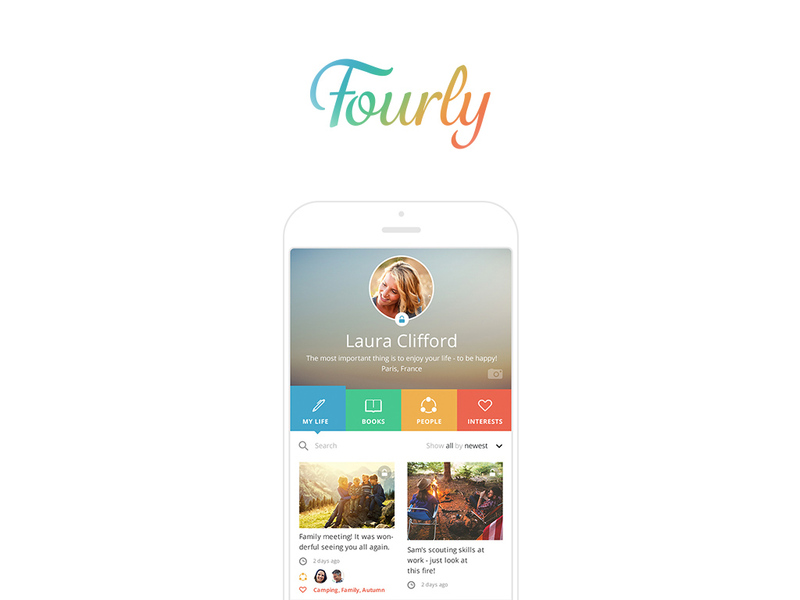 Fourly is here to bring some realness to the world of social media. Kristina, tell us a little bit about yourself! Kristina: I have worked since I was 13. I grew up in a big family in the countryside of Latvia so I’m really a country girl. I went to study in America, I achieved a lot of my dreams but I worked very hard – nothing was given easily to me. Then I worked for international companies as a project director but as I became pregnant with my first child, it was the moment when I realised I’m tired of making everyone else successful. So you went back to Latvia? Kristina: Yes. And as I was expecting my daughter, I started looking for materials about babies but there was no quality reading in Latvia and I had to order books from America. That made me realise that there might be others who want to find quality materials so I made a small website and translated some articles and the feedback was surprising! I invested some money into the site and long story short, we had 75 000 unique visitors per month in two years without any money in advertising. But actually it’s hard to make money without any advertising – yes, we managed but without any profit. So I had an idea that moms would also like to buy toys and DVDs and in 2009 I launched an e-shop and then the business went up. 2012 I decided to move my business to Estonia because it seemed that Latvia was too small for us and we thought of heading to Europe. In 2012 Estonia already had euro, Latvia did not. But right before 2012, I got an offer to sell the Latvian part of my business. I decided to take the offer and take a sabbatical. I really needed some time off, after what I worked some time in Switzerland. Around that time I noticed that when I post pictures to Facebook only the happy ones get a lot of likes. But what happened when I posted something with what I struggled or I had a bad day? Maybe one or four likes but not a hundred. Facebook is so untrue – nobody really knows what’s going on in my life except for my circle of trust but with them, I don’t need to communicate on Facebook. And that was the moment when idea about Fourly came to me. I thought about the algorithm that controls my feed and also about the cost of social media. People think it’s free but it’s usually not. Also, Facebook kind of makes us forget the negative but life is not only about ups. It’s also about downs. I started seeing all the studies behind this problem and one point that I figured out was something that Facebook calls a self-censorship. Did you know that 72% of people type a comment but do not post it? 72% is a lot! It means that people do not feel safe in that environment. But Facebook makes research about the posts that you are not posting because they want more and more people to post. Another study showed that 93% want to be in control of their content and one of my favourite writers wrote an article titled “Mark Zuckerberg, Let Me Pay for Facebook” where she pointed out the same things that are important to me. Most of the people are mislead by the fact that Facebook is a free service and when I say that for using Fourly we charge you 99 cents per month, people are surprised at first and ask why should they pay? In Facebook, I’m a product not a customer. In Fourly you are a customer, not the product. To be honest, most of the internet does not care about your content. So what exactly is Fourly? Kristina: Fourly is platform where you can be real. On Fourly you can share your memories that feels so natural to us with the people you choose. There are different levels of trust you know. 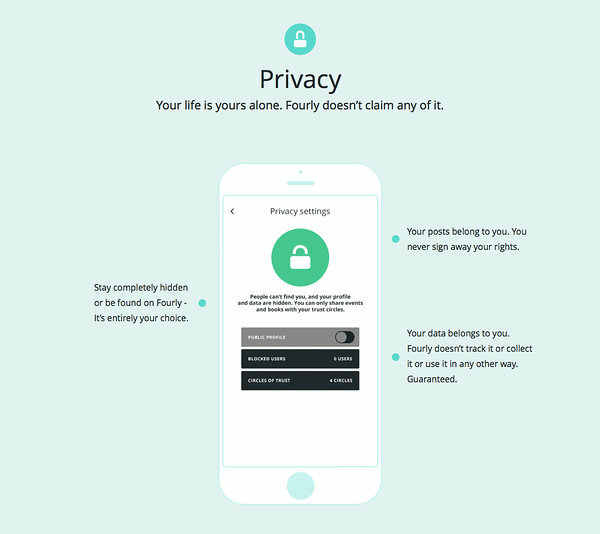 We designed Fourly to be ad-free, spam-free and we are not selling any kind of data. You have your own private timeline, you can share it if you want, you can add smart tags if you want to find moments faster. 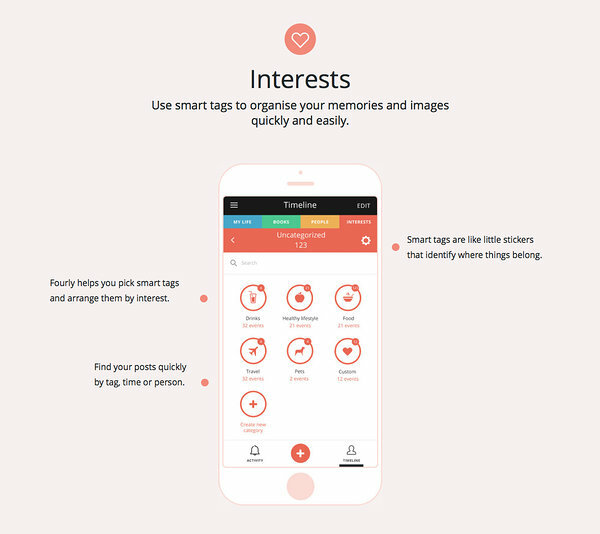 You can also add a little sticker or smart tag to find relevant content. 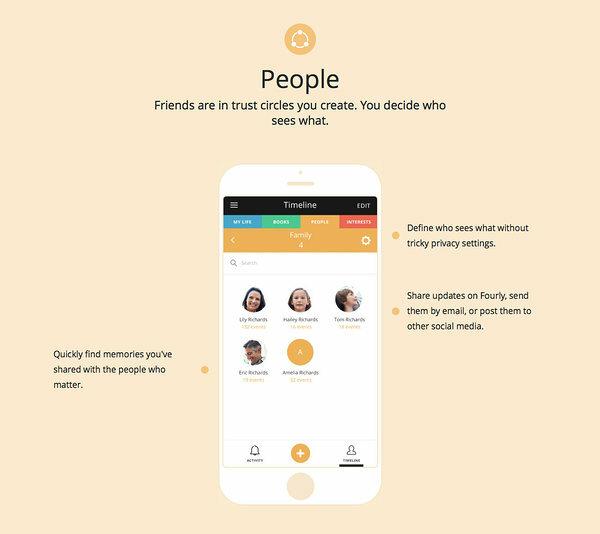 The whole idea was based on a circle of trust – let’s say we have groups like family, friends, coworkers but you define who sees what. You have to bare in mind that at first, the newsfeed will be very quiet because there are no ads or irrelevant content. 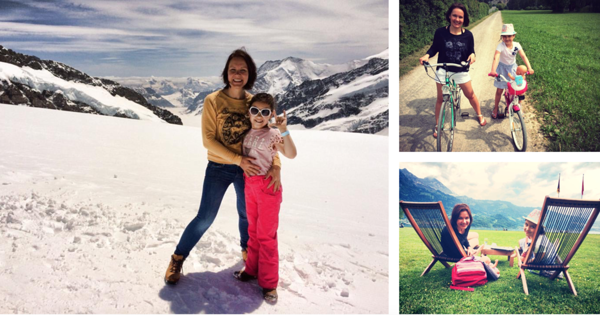 It’s about real life – things that actually happen offline but we want to have memories. So, Fourly allows you to make albums with memories and you can actually print those albums out so you’ll have a real thing. Kristina: Four is the number of menus which serve to help the users : My Life, Interests, Books (Albums), and People (Trust Circles). Kristina: The whole business model is based on subscription. We are offering our customers the service for 99 cents per month. Everything is included. I believe 99 cents is a micropayment for the value you get. Currently, the investments for Fourly have been made by me and a some small sums from close friends. Who’s the team behind Fourly? Kristina: I have a designer and a developer who are working from Latvia. We use Trello and other tools to make this kind of work happen and it’s actually very fine since we have been working together for nine years with some previous projects. You know, in the big companies there are meeting after meeting but nothing gets done! We don’t have those kinds of problems. I knew from the start that I wanted those two guys to my team. Both the designer and the developer are also co-founders of the company so I only had to pay them 50% in the first year. At the moment we can’t have more employees because everything is financed by me and it sure hasn’t been an easy start but hopefully it will get a bit easier. In order to raise some more money, we launched the lifetime membership. And we did raise some money but not enough. Lot’s of struggles, lot’s of no-s as well. Are you planning to do some crowdfunding or what plans do you have regarding the investing? Kristina: Yes, we tried Kickstarter but it did not go well for us. We did not have the PR and the press to back it up. But I would like to see how the word of mouth marketing goes. If something is really good, people will talk about it. If it does not go so well, we will of course use the traditional marketing methods. We do need an angel investor to provide much-needed financing so we can grow into a scalable business. To many of them, a subscription based business model for social media is something quite new, and not many believe it can take off. What about the target audience? Kristina: College and up and of course family but why not golf buddies who currently are in secret groups in Facebook. When we talk about competition… do you see Facebook as your biggest competitor? Kristina: Fourly is different from Facebook. Connecting is good and you can find people that you lost touch with, so for connecting, Facebook is good. There are some similarities with other apps like Path – they might be our biggest competitor. Where do you see Fourly in ten years time? Kristina: I have three goals. The first one is that we will have 100 downloads per day, that’s the first and the smallest goal. In two years, Fourly should have 10 million users – that means the idea is worth it. And the third goal is 25 million users. But we are realistic yet hopeful! Fourly will be available in March! Make sure to check their homepage and social media feed!